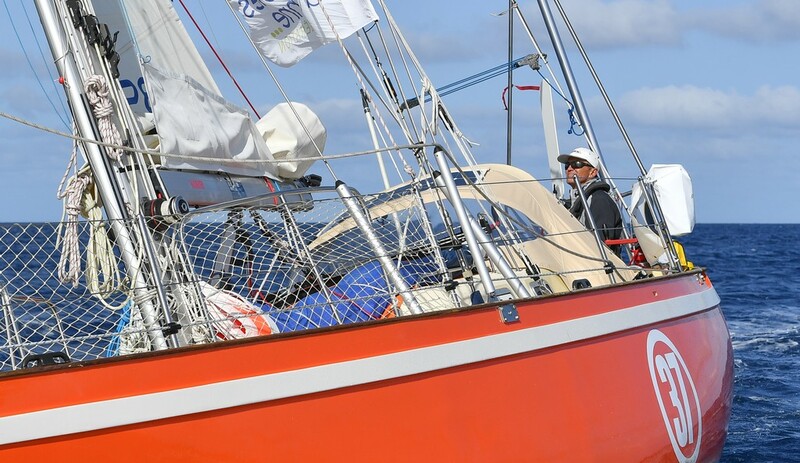 Fourth placed Golden Globe Race competitor, American/Hungarian Istvan Kopar and his Tradewind 35 yacht Puffin, expected to reach Les Sables d’Olonne around 09:00 UTC on Thursday 21 March. Early Monday morning Kopar was within 250 miles of the finish line, making 5.1knots, having managed to cover 120 miles during the previous 24 hours – a remarkable performance given the steering problems that have plagued his solo circumnavigation almost from the start. He is still having issues, reporting Sunday (17 Mar) that his replacement rudder blade on his wind vane self steering is too short and being lifted out of the water as his yacht traverses the waves. The latest weather forecast suggests that the current north westerly winds will decrease overnight slowing progress to around 100 miles during the next 24 hours. Then on Tuesday the wind is predicted to become very light, suggesting a 70 mile day before building again on Wednesday but turning north easterly to turn the last 70 miles into a challenging beat to windward. Fifth placed Finnish sailor Tapio Lehtinen and his barnacle infested Gaia 36 Asteria remains trapped in a challenging wind hole in the South Atlantic. He has managed to cover less than 400 miles during the past 8 days – an average of just 50 miles. At this rate, he will not finish before mid-May, but reports that all is well onboard.